You will no doubt have spent a considerable amount of time preparing for your cross-Channel swim. You have checked and double checked all your equipment, and now at last you are ready. The big day has finally arrived! Arriving at the Dover car park you make your way along the pontoon which runs by the side of the Dover Marine offices and wait for Andy King and Louise Jane to moor alongside the pontoon. Boarding Louise Jane you will be introduced to the crew member(s) and the Observer. Once you have stowed your equipment, We will leave the pontoon and head to the western entrance of Dover Harbour. Having left the western entrance behind, the boat will turn to starboard and head towards Samphire Hoe. This usually takes about half an hour or so. During this period you, the swimmer, will start preparing for your swim. Once there You will go over the side and swim to shore.or going the tender Having swum to shore and crawled up onto the beach above the waterline, you are now ready to start your cross-Channel swim, waving to the boat where the Observer will be able to acknowledge the start of your attempt of the English Channel by the sound of Louise Janes horn or a Wishle. Ideally, it is best to position yourself some 2m to 3m from either the port or starboard side of the boat. Remember you are following the boat, as the skipper will set an appropriate course for France. Now that we're underway the skipper will radio Dover coastguard informing them that the swim is in progress and how many people we have on board. It is usual for the first food or drink stop to be approximately an hour after commencement, but this is always down to the individual swimmer. Our next radio conversation with Dover coastguard will be as we enter the South West shipping lane. This is where the skipper becomes even more vigilant as there will be some very large ships in the South West lane. Whilst we are flying ‘cones’ indicating to other ships that we are restricted in our movement sometimes, being only a small boat, these are not seen by the larger vessels although they should always be picking us up on their radar. The skipper radios any ship that we feel may not have seen us and asks them to go astern of us. Having crossed the South West lane the skipper notifies Dover coastguard that we have done so. We now cross the centre partition of the Channel and on entering the North East Lane we inform the French coastguard accordingly. Proceeding to the outer edge of the North East Lane the skipper will again notify the French coastguard to say we are now leaving the North East Lane. Now we are on the homeward straight and should be able to see the lighthouse at Cap Gris Nez (from the boat). We should by now be moving south-east as the tide on the French side is always stronger than on the English side. This usually means it takes us past the lighthouse but, as the tide will change again, it should bring us up onto a beach just south of the Cap Gris Nez. The boat will stand-off probably 200 to 400m from the shore and a crew member will accompany you in the dinghy to the shore. You must exit the water and clamber up the beach to above the water line so that the Observer can confirm the completion of a successful cross-Channel swim (you must clear the water). 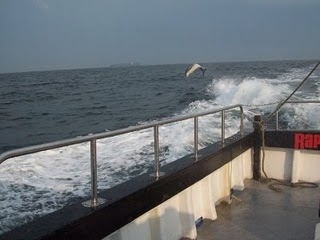 Sea fishing and cross channel charter boat.